Experience a superior 18 hole golf course that you and a friend can enjoy with today’s TeamBuy deal: $75 for 18 Holes of Golf for 2 with Cart Rental and Range Balls at Lacombe Golf & Country Club. You are just a short distance away from one of Central Alberta’s finest golf courses. Lacombe Golf and Country Club is situated midway between Calgary and Edmonton along the QEII. The golf course is a very traditional par 71 layout, with many large trees lining the fairways. Accuracy is at a premium, because if you avoid the trees, the small undulating greens will certainly test your spirit. Lacombe Golf and Country Club is situated midway between Calgary and Edmonton along the QEII. It’s about 90 minutes north of Calgary. This is a limited 1-week only sale that will expire at midnight on Thursday, August 21, 2014. Experience every golfer’s dream of practicing your game while viewing the stunning scenery that British Columbia has to offer with the help of today’s TeamBuy deal: $139 for a Round of Golf for 2 People with Cart Rental at Trickle Creek Golf Course. Experience the breath-taking view of British Columbia while practicing your golf game with a friend. Located in beautiful Kimberley, British Columbia. Woven through the rugged alpine environment, crossing creeks and diving with the slopes of North Star Mountain. Designed by renowned architect Les Furber, the course was recently awarded a Bronze Medal by readers of SCORE Golf Magazine for being one of the top resort courses in all of Canada. Offers golfers the chance to experience a unique and challenging 18-hole golf course. Trickle Creek Golf Course is located in beautiful Kimberley, British Columbia. The course was recently awarded a bronze medal by readers of SCORE Golf Magazine for being one of the top resort courses in all of Canada. It is approximately a 4.5 hour drive from Calgary. This is a limited 1-week only sale that will expire at midnight on Tuesday, August 19, 2014. Extended Update: Thanks to popular demand, TeamBuy has extended the deal! TeamBuy featured the deal last week and it was a hot seller! Here’s your 2nd chance to buy the deal if you missed out before. For all those who take their downtime seriously, this exceptional golf course is sure to impress! Enjoy a round of your favourite game in the old stomping grounds of some of the world’s mightiest dinosaurs with today’s TeamBuy deal: $69 for 18 holes of golf for 2 Including Cart at Dinosaur Trail Golf and Country Club. The stunning badlands of Alberta will be a perfect place for your next round of golf! Lush, rolling greens are surrounded by striking rock formations, where mighty dinosaurs used to roam. You’re sure to get a very enjoyable mix of challenge and fun navigating these well-designed holes. After the game, why not enjoy a drink and a bite to eat on Drumheller’s best patio! Dinosaur Trail Golf & Country Club is located in Drumheller, about 90 minutes north of Calgary. This is a limited 1-week only sale that will expire at midnight on Monday, August 11, 2014. Whether you’re a regular Arnold Palmer, or just a new player looking to get into the swing of things, check out one of Calgary’s finest golf courses with today’s TeamBuy deal: $77 for 18 Holes of Golf for Two with Cart and 2 Buckets of Balls at Strathmore Golf Club ($158 Value). Strathmore Golf Club is located 25 traffic free minutes east of Calgary on Hwy 1. Strathmore Golf Club offers 18 of the finest championship holes of golf in southern Alberta and is known for its lush fairways & fast greens. VALID UNTIL THE END THE 2014 SEASON! Built in 1921 and most known for the impeccably kept fairways and greens that are second to none. Professional Canadian golfers have praised this course as being ideal to practice on. The 5th hole awarded Best in Calgary by Calgary Sun in 2011. Tags: Masters, ping, flop shot, slice, bunker. Terrific course that’s only 30 minutes from Calgary! Superb chance to escape the anxieties of the office for an afternoon. Options available for groups of 2 or 4 people. Enjoy 18 holes of golf with the use of a power cart, plus hot dogs to chow down on! 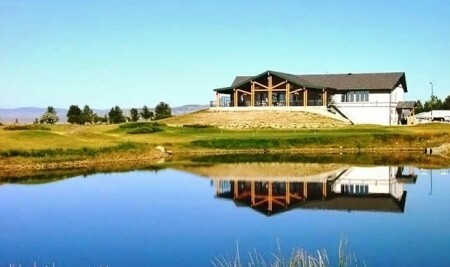 Muirfield Lakes Golf Club is a semi-private course located 30 minutes from Calgary. This is a limited 1-week only sale that will expire at midnight on Thursday, July 31, 2014. Claresholm Golf Course is located just one hour south of Calgary and 45 minutes from Lethbridge. The 18 hole golf facility offers a well stocked pro-shop, licensed restaurant, driving range, power carts, practice green and private or group lessons from our golf pro, Lyle Broderson. Excellent 18-hole facility includes a well-stocked pro-shop, licensed restaurant, driving range, practice green and more! Bunkers are abundant and water comes into play on 13 of the holes for that extra little challenge. Great location surrounded by beautiful wilderness, easily accessible from Calgary and Lethbridge. Afterwards, relax and enjoy the scenery with some snacks and refreshments from their fully-licensed restaurant! This deal is going to be a hot seller so don’t miss out! This is a limited 1-week only sale that will expire at midnight on Tuesday, July 225, 2014. Extended Update: Thanks to popular demand, TeamBuy has extended the deal! TeamBuy featured the deal last week and sold over to 400+ vouchers! Here’s your 2nd chance to buy the deal if you missed out before. Ideal location just 25 minutes outside of Calgary – nothing but gorgeous nature all around! Golf lovers of any age are sure to be entertained by this very well-designed course. Generous packages feature carts for your comfort, and free drinks to relax post-game! It’s the perfect way to get out in the fresh air to enjoy a beautiful summer day. Carstairs Golf Club is a beautiful golf facility located in Carstairs, Alberta which is only 25 minutes North of Calgary and just 15 minutes North of Airdrie. UPDATE: It looks like the promo code has reached it’s cap limit and is no longer available even though it was original schedule to expire at midnight on June 29th. TeamBuy sets a limit on how many people can use the code so it’s important to hurry and take advantage of it while it lasts. TeamBuy.ca is offering an incredible extra 30% off site-wide promo code! 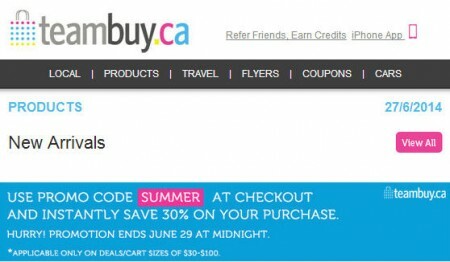 You can save an extra 30% off your purchse on TeamBuy.ca when you enter the promo code SUMMER at checkout! This is the biggest discount promo code that I’ve ever seen on TeamBuy! The promo code is valid now until Sunday, June 29, 2014 at midnight. The code is applicable only on deals/cart sizes of $30 – $100. Hurry, only a limited amount of people can use the code so take advantage of the offer while you still can! To maximize your savings, you can add as many different deals to TeamBuy‘s shopping cart as you want. The promo code will instantly deduct 30% off your entire purchase. I’ve tested the code and can verify that it works. This is a hot deal because TeamBuy rarely offers promo codes and most of their deals is already discounted 50-95% off! You’ll find some amazing deals with the extra 30% off. Lakeside Greens Golf Club is a semi-private beautifully manicured 18 hole Championship Golf Course. It is located in the heart of the growing town of Chestermere, just 20 minutes east of downtown Calgary. I’ve played the course many times and highly recommend it. The vouchers are valid for the entire 2014 golf season. Just 20 minutes east of downtown Calgary. Gentle enough for high handicappers but it will still give more advanced golfers a chance to use their skill. Overlooking the 9th and 18th greens, The Point restaurant is home to Chestermere’s most sought after patio that offers a huge built in BBQ. Measures 6744 yards from the longest tees and has a slope rating of 128 and a 70.8 USGA rating.